Released August 11, 1915. Edison Company/General Film Company release. One reel. Copyrighted August 2, 1915 (LP5990) by Thomas A. Edison, Inc. Produced by Thomas A. Edison. Directed by Will Louis. with William Wadsworth (Riley), Mabel Dwight, Jean Dumar, Guido Colucci, Marie La Manna, Raymond McKee, O.N. Hardy. The newly rich Riley wants corned beef and cabbage. His wife, with social aspirations, won't tolerate it. One day she tracks him to a poor neighborhood, and finds him heartily tucking away corned beef and cabbage cooked by a "widder woman." His wife also finds her daughter there, very much in love with the "widder woman's" son. So they all go home to Riley's for corned beef and cabbage. --Motion Picture News. It appears that Babe plays a servant in this one, and that his buddy Raymond McKee must be the widder woman's son mentioned in the synopsis. The Braff Silent Short Film Working Papers doesn't mention the film at all. 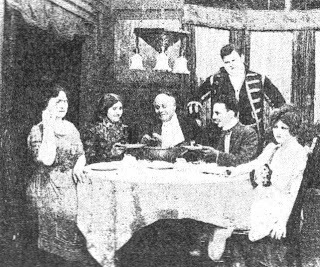 American Film-Index, 1908-1915 lists the film and cites Fred R. Ashfield as the film's author. Motography and Moving Image World also published a synopsis for the film. Hope to dig up a review next time I am up in D.C. Thanks for keeping an eye out Steve. The photo seals the deal, no doubt about Babe being in this one. What a great new find! The start of 2009 has been a good one for Laurel & Hardy fans! The color footage of Stan and Babe on stage, the Babe Hardy baseball color footage and the Stage and Screen Memorial Club color footage. This is great news, although since it is just a film credit it is yet another lost film. Still, you can't look for something if you don't know that it exists. Hi, Rob, or Bor as the case may be. I just stumbled across your blog and am really enjoying it.